Have you seen that mask in the stack before? Are you sure? To become a master kabuki actor, you must prove that you can identify all masks you see and remember where they are located, and Illusion will test those memory and recognition skills. The game lasts three rounds. To set up a round, each player takes 4-5 coins and someone shuffles the mask deck, then lays out the four actors around the deck. 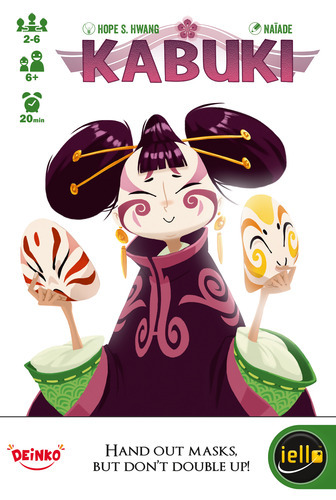 The deck consists of ten different types of masks, with five cards of each type. On a turn, the active player reveals the top card of the deck, then places it on top of one actors of her choice. If any opponent thinks that this type of mask is already present in this stack, he can yell "Stop!" If the accusation is true, the accuser takes as many coins from the active player as the number of masks of this type buried under the top card; if the accusation isn't true, then the accuser loses one coin, placing it out of the game. The round ends when one player has no coins remaining or the deck of cards has run out. Players tally their score for the round. The player with the most coins after three rounds wins.